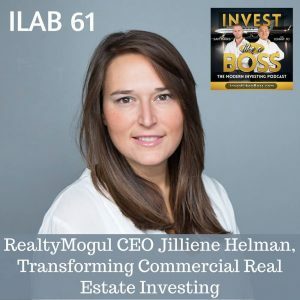 Jilliene Helman is the CEO of RealtyMogul, the largest online marketplace for investors to pool money and crowdfund pre-vetted real estate investments. Prior to RealtyMogul, Jilliene served as Vice President at Union Bank, where she spent time in wealth management, finance and risk management. The RealtyMogul team brings over 200 years of collective experience underwriting, managing, and acquiring over $20 billion in real estate across asset classes and markets nationally. During the show, Jilliene will explain why RealtyMogul has over 125,000 investors and what real estate investing can do for you. You’ll learn about popular cash on cash returns, investing limitations and options including the legal underwriting process. Find out how they’ve returned back over 60 million dollars to their investors. Listen to ILAB 61 on iTunes here or subscribe on your favorite podcast app.